Timeless Ping with Output: Another option to text connectivity, and a preference to put it in the .txt file instead of in the command window. Right-click the Start icon (located in the lower-left corner). From any screen, press the Windows key+X ( +X). From the Windows desktop, click Start. From the Start Search text box enter cmd then press the Enter key. Enter cmd then press the Enter key. Enter command then press the Enter key. 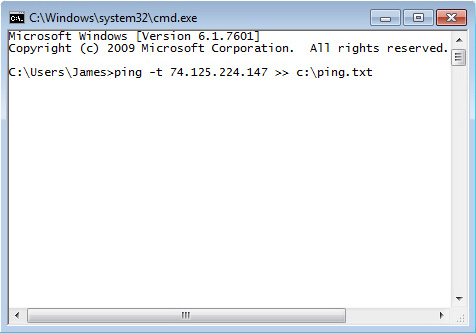 Enter ping -t 74.125.224.147 >> C:/ping.txt then press the Enter key. In Windows, Vista administrative privileges are required, navigate: Start > All Programs > Accessories, right-click Command Prompt then select Run as administrator. In Windows 10, select Command Prompt (Admin) to run as an administrator. 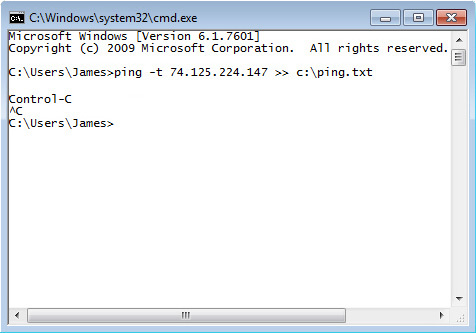 As the ping command is executed, there will be no indication the process is running. Allow the process to run 6 to 12 hours then press Ctrl+C. Open the output file (e.g. ping.txt) to review the test results.